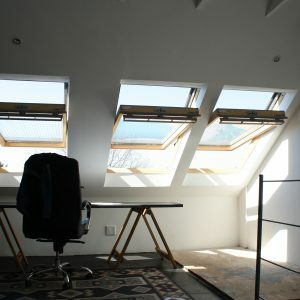 Once we have created your new space, and if it is going to be used for a living area, then we need to provide sufficient natural light to the area. 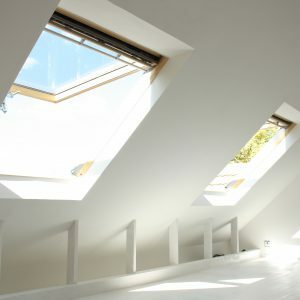 Our recommended solution is a selection from the Velux range of flat roof windows which range in size from 550 x 980 mm up to a massive 1140 x 1400 mm. Flat roof windows are a modern alternative to the traditional dormer window and provide a number of advantages over the dormer. Because they are mounted flat onto the roof and have no side walls they allow more direct and undeflected light into the area and provide a wider field of view than a dormer. Installation of a flat roof window is a much simpler exercise than installation of a dormer and involves far less intervention and modification of the existing roof structure. Velux roof windows are supplied with a factory designed and manufactured flashing which ensures that the windows will not leak. The windows are double glazed and feature a high quality Norwegian pine finish with brushed aluminium fittings. They are also available in a powder coated aluminium finish. Another option is the top hung feature, which allows the window to pivot from the top as well as the centre. They feature a vent which is built into the handle mechanism. This vent allows for ventilation even when the window is closed. A full range of window blinds in blackout, roller and venetian configurations is available.